Provide help desk technicians with immediate solutions to questions about software, hardware, operating systems and the Internet. Use the features and capabilities of your call tracking system and Knowledge Management system to search the KnowledgeBase and deliver immediate answers to your support technicians. Each high performance plug-and-play solution has been tested on real time callers. Formatted for leading call tracking systems, KnowledgeBases deliver a broad base of immediate support to your help desk. Require re-training for same functions? Our experience shows a potential licensing payback period of less than one year based on full rollout to end users and help desk personnel after installation. Additional ROI, customer satisfaction and profit center opportunities continue to be available later with the approach selected. End user timesaving and reduced call escalation (first time resolution) has not been used in this estimate but will enhance expected results. Send us a list of questions that are not resolved by this KnowledgeBase*. We will incorporate your queries into our content build and include the solutions in our quarterly updates. The result is a larger, smarter KnowledgeBase continually fine-tuned to the needs of its users. There is no additional charge for this service. *For the titles supported by your license. 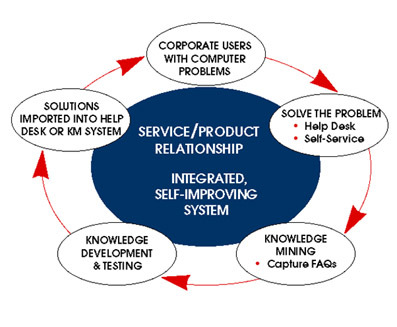 Solutions that Work, from KnowledgeBroker. Cherwell Software Announces Integration Partnership with KnowledgeBroker, Inc. Copyright 2014 © Reno Software LLC Represented by KnowledgeBroker. All rights reserved.